Emergency Water Damage Services London – You have water damage in your property, what do you do now? Upon discovering water damage, you should make sure you are safe; keep away from all saturated or wet areas, avoid standing in water and then phone Water Damage on 0800 246 5311. An experienced IIRCR qualified Water Damage Restoration Technician will answer your call and primarily assist you over the phone. At Water Damage we specialise in restoring the property to as close as possible to its original condition. This includes perishable contents too such as books, documents, photographs, rugs, carpets, drapes and curtains, sofas, tables and chairs, and many more. These items ARE normally saveable! Often, carpets, curtains and sofas can be dried in place; there is often no need to remove them! Just ask our specialists what we can do; if we can save it, we will! Take a look at our Picture Gallery to see the type of equipment we use to save items. Put wet books, documents & photographs in the freezer and allow the water to turn into a solid (ice). This will help prevent the pages from warping and the ink from running, and through the process of Sublimation, the paper can be returned as close as possible to its original condition! Electrolytes in water can carry electrical current! Avoid standing or coming into contact with pools of water inside your property. Never permit the installation of air movers or dehumidifiers if you believe mould to be present. 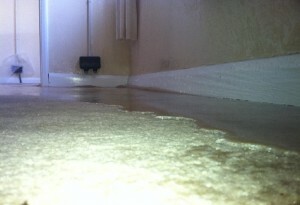 It may circulate the mould around the property making things much worse and creating a significant health hazard. There are 3 main types of dehumidifiers. Using the wrong dehumidifier can significantly hold up a drying job! Water Damage specialists know their dehumidifiers and can ensure that the drying is conducted as swiftly and safely as possible.